Spots, speckles or splash-like deposits on, or discolouration and staining of, the paint surface. The surface may have greasy or tacky spots, be coated with particles, or feel gritty. a) Tree sap and resins, wet leaves, berries, fruit or bird droppings allowed to remain on the paint. b) Metallic particles becoming embedded in the surface of the paint and oxidising. c) Salt deposits resulting from the evaporation of liquids on the surface. These may also lead to blistering. d) Cement or other chemically active dust. a) Do not allow any deposits to remain on the paint surface. b) Ensure the paint film is fully cured. c) Store vehicles under cover and away from possible sources of contamination. Take special care not to expose new paint finishes to environments likely to cause contamination. d) If an oven or drying room is used ensure that the filtration system is working properly, and that no industrial fumes enter the room. 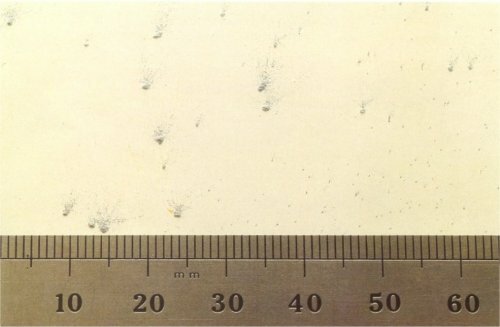 Light staining may be removed by washing the surface with a mild detergent solution, followed by washing with a 10% Oxalic acid solution to remove ferrous compounds. Rinse, compound and polish to restore the gloss. If discolouration and staining persist, rub down the surface and repaint.